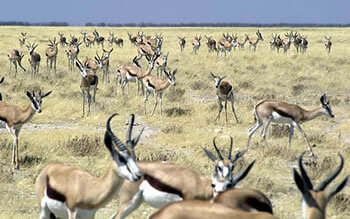 Namibia intrigues even the most experienced African travelers. Here one finds the hot sands of the world’s oldest desert and tallest dunes, and the freezing waters of the life-filled south Atlantic. Animals range from desert elephant (the largest elephant in the world), to cape fur seals, to the antelope purported to have given rise to the myth of the unicorn: the gemsbok. German-speaking villages brush up against “click-language” nomadic cultures. Space is not at a premium in Namibia; one can go for days without seeing another soul. This affords virtually unlimited opportunities for 4x4 exploring and bushwalking where relatively few others outside of Africa have gone. The following itineraries are meant to help your safari planning. 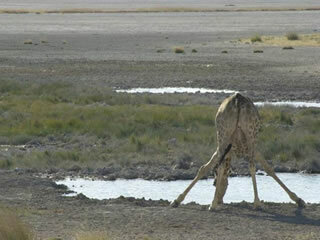 Since 1974, we at Cowabunga Safaris have done many, many kinds and variations of safaris to Namibia. Do you want something more upscale? Do you want something more rustic and participatory? If you have a different safari in mind, wish to stay longer, or want to travel to other parts of the continent, tell us. We can make it happen. The safaris below are in PDF format. To view them you will need the Adobe Acrobat viewer/plugin.